A man was injured when a pony bolted free from a pen at a county show and hit him. Eyewitness Mike Hughes said a girl fell off the pony before it ran into the pedestrian area at the Bridgend County Show. The Welsh Ambulance Service confirmed paramedics were called to the show just after 12:20 BST. 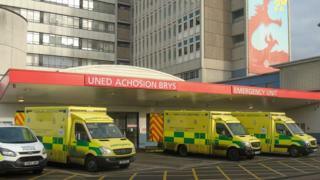 The man was taken to the University Hospital of Wales in Cardiff in an ambulance. Mr Hughes, who works as a farrier in Pencoed, said the small grey pony ran 150 yards into the pedestrian area, after breaking through a gate. "A girl was warming up with the pony before a little show, when it threw her off its back," he said. "Luckily, [the collision] happened right by the first aid tent and there was a first aid responder there." Mr Hughes, 36, said the pony was quickly caught and put back in a pen by the owner. Hayley Parsons, 28, from Coity, was at the show with her partner Sean Barry and nine-month-old daughter Belle. She said: "We were watching the horse show and one came running into the crowd from nowhere. "My partner was holding [Belle] and it was heading right in our direction... he just ran away from it. "I was shaking. It was over really really quickly. Someone caught the horse and walked it back to the pen." She said she was left shaken by the experience: "It was scary... if it had been a fully-grown horse it would have been so different." The organiser of the three-day show, which is in its 72nd year, declined to comment when contacted by the BBC.